I booked by flights in September with Scott’s Cheap Flights (highly recommended! ), too late for the 4-day Inca Trail trips, which was a blessing in disguise. This is fairly common as these trips can be booked six months in advance or more, something to keep in mind for people who plan trips further in advance. I probably would have been able to do it physically, but I wouldn’t have really had fun sleeping in tents for three nights and hiking all day. The process was truly once-in-a-lifetime, so buckle in for a long post on the ins and outs of my trip. There are dozens of options when it comes to getting to Machu Picchu. Before we go any further, you do NOT have to hike to get there. Many travelers arrive to Aguas Calilentes and take the bus to tour the site for the day before going back to their hotels. There’s nothing wrong with that. 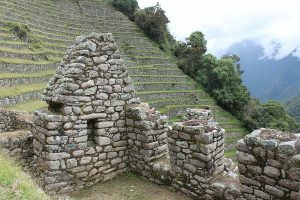 There are also alternative treks that travel through parts of what’s considered to be the “official” trail, like the Salkantay Trek. Decide first what’s right for you, whether that’s a day trip or a five day trip, campsite or hotel, group tour or private guide. 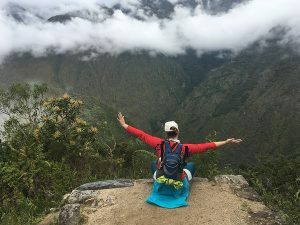 After LOTS of research and input from fellow bloggers and travelers, I went with a two-day Inca Trail trip with Alpaca Expeditions because it is Peruvian-owned, a fact that was important to me after my Guatemala trip. There are plenty of big-name companies that run these tours, including G Adventures, but I wanted to go with a small business. My two-day tour ended up costing over $550 USD, plus the costs of gear rental and tips for our porters and chef. There are certainly cheaper ones, and you can sometimes join a last-minute tour when you arrive, but I didn’t want to risk it. 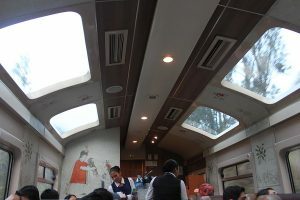 That rate included all transportation, including buses and trains, entrance fees, all meals from breakfast on the first day to breakfast on the second day, a local guide, and porters to carry your gear. I also upgraded to an extra foam pad for added comfort in my tent and an additional hike within Machu Picchu. There was a pre-trip meeting the night before where we met our guide, Primo, and the group, made up of mostly those aged 20-35, including four Canadian girls, a German girl, and an American couple. We talked about the hike itself, which reach as high as 8,600 feet and a distance of about 9 miles. 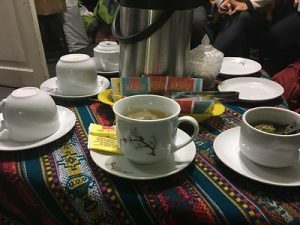 We were told what to pack and given duffel bags to bring, as we enjoyed our coca tea. He told us about the trail itself and answered a number of questions, lessening my fears of falling behind. I will say that one girl got food poisoning the night before our trip and had to forfeit the cost of the tour. This is why Travel Insurance is essential! Despite only doing two days of hiking, I was still concerned about the trail so I did my best to prepare, including a few long walks and hikes like the one to the Hike Inn. I had no way of preparing for the altitude since Georgia is not far from sea level, but made an effort to walk every day. It also gave me a chance to practice with my trekking poles. I purchased a few items specifically for this trip, but mostly borrowed from my sister. I did worry a bit about the cold, but thankfully the temperature wasn’t too low during my time there. Following the guidelines for recommended water, I brought three one liter Platypus bottles that I could collapse when empty and refill at campsites. Another item that came in handy was a water bottle holder that I could easily grab without pulling it out of my daypack. And when it comes to your daypack, bring as little as possible! You’ll have it all day. If you’re sensitive to altitude sickness, you might want to take Diamox, but I didn’t end up needing it. Cusco is a hub for not just Machu Picchu tours, but also Rainbow Mountain and Sacred Valley trips, so you likely won’t be the only one awake at 4 am to pack up. This is what time almost all operators leave in order to take the bus to Ollantaytambo where you’ll take the stunning scenic Peru Rail train to the trail head. Along the way, you get to see the valley from big windows and enjoy free snacks like coffee and cookies. The two day hike starts at kilometer marker 104, whereas the four day starts at 82. We arrived near Chachabamba, a lesser-known Inca site, for a quick breakfast of eggs and fruit before we started walking. The first part was the hardest, but was actually easier than usual because of recent trail washouts causing a detour. We were all wheezing as we adjusted to the altitude from around 6,000 to 8,600 feet, but I thankfully listened to podcasts to keep my mind off of the pain. At the beginning, we were passed by faster groups and porters fairly frequently, but then we found our stride. Along the way, there were so many things to see, from the river cutting through the valley to dozens of colors of orchid. We had lunch near Winay Wayna, another unbelievable Inca site, before the trail leveled out. Late in the afternoon, the sun started to set and clouds gathered around the Sun Gate, the perfect spot for photos before continuing down the mountain to Machu Picchu. We weren’t the only ones there, but most day trippers had already left to catch the bus. Instead of actually entering the park, we got our photos of the near-empty city from just outside it like the one above. Alpacas joined us for photo ops and we all got excited about the day ahead. Our campsite was located just beyond Aguas Calientes, so we hopped off the bus before dark and walked down to see our tents already set up. There was time to shower and clean up before having tea and snacks before dinner. 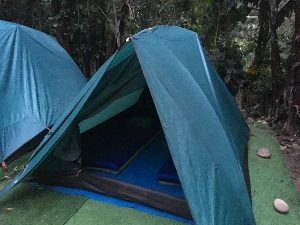 The tents themselves were comfortable and I slept well in my rented sleeping bag. There was a bathhouse nearby with showers and toilets, but I was glad to have my headlamp because lights were scarce. My Birkenstocks were also essential so that I didn’t have to wear my sneakers with swollen feet. Every meal on this trip was excellent, especially considering that all of the ingredients and equipment were carried from the trailhead. They were very accommodating of dietary requests, including my dairy-free diet to vegetarians. For dinner they actually made sculptures out of food, including a vegetable condor! 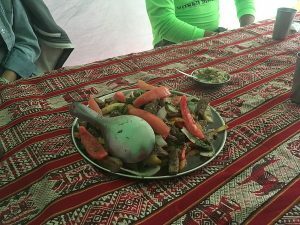 We had real food like steak and soup made with fresh ingredients that fueled us for the hikes ahead. I cannot say enough good things about the food. The second day was made for exploring Machu Picchu. We walked 30 minutes to Aguas Calientes, where we lined up to catch the bus to the site itself. There were already at least 50 people already, but we were at the gates early. Primo gave us a historic tour of the site, telling us about its history, before saying his farewells. From there, some of us went on additional hikes while others went back to town for lunch. 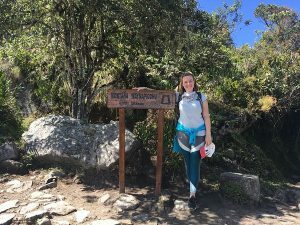 Since I wasn’t doing Dead Woman’s Pass, I paid extra to hike Huaynapicchu (or Wayna Picchu), which I later found out was one of Buzzfeed’s most dangerous hikes. Thank God I’d already survived one of them. It was difficult, with much of it on my hands and knees, stuck behind others or pausing to catch my breath, but well worth it for the incredible views. I would recommend it if you’re of adventurous spirit, forgiving body, and can book a spot. I finished my two days on the Inca Trail and Machu Picchu on a high, both literally and emotionally. I was so proud of myself and the work my body had done to get there. 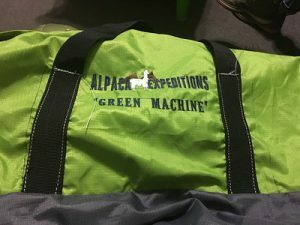 We received neon green t-shirts from the tour company, proclaiming us part of the “Green Machine.” And I really felt like I was a part of the team, despite traveling solo. I couldn’t be happier about the company I booked with, knowing that they support their employees and the surrounding communities. They also protect the environment and pack out their trash. I’m not sure it’s something I’ll ever do again, but am so glad I conquered my fears and made it happen. 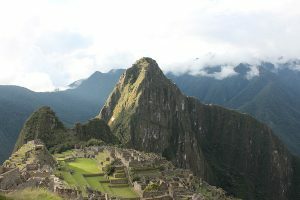 Have you hiked the Inca Trail or been to Machu Picchu? Share your tips below.